Climate change in Vermont is resulting in hotter summers, shorter winters, and more frequent storms. These trends are expected to continue in the future. The devastation from Tropical Storm Irene, the increasing occurrence of Lyme disease, and more frequent cyanobacteria (blue-green algae) blooms are just a few examples of how climate change can impact Vermonters’ health. While everyone’s health is affected by climate change, certain people and places are more vulnerable than others. Taking action to minimize the impacts of climate change can improve the health of Vermonters today and in the future. What do I need to know about climate change and health? Climate change is already happening, and is expected to continue. Certain people and places are at greater risk for climate-related health impacts. Responding to climate change can benefit health now and in the future. 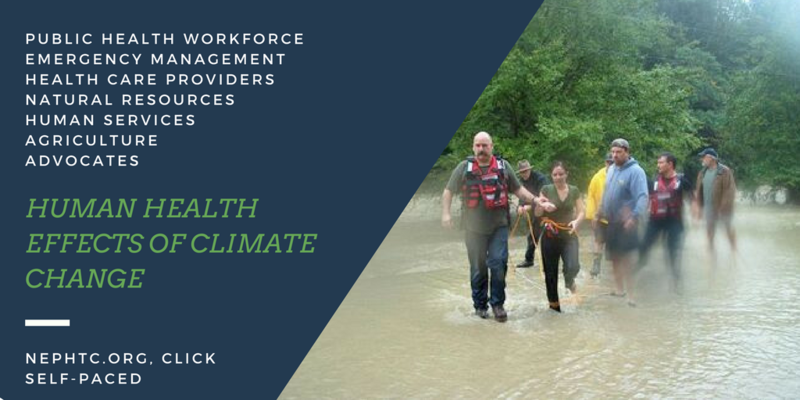 Climate and Health Profile Report This report is an in-depth review of how climate change may affect public health in Vermont. It has a summary of climate change in Vermont including projected changes in the future, an overview of climate-related health concerns—heat-related illness, mosquito and tick-borne diseases, health effects from extreme weather events, food and waterborne illness, pollen and air quality issues, and cyanobacteria (blue-green algae). Climate Change and Health in Vermont White Paper This white paper provides a summary of current and expected impacts of climate change on health in Vermont along with discussion of adaptation and mitigation actions that can be taken to reduce Vermont’s contribution to climate change while improving the health and well-being of Vermonters. Climate Change and Your Health This is a two-page summary of the ways that climate change can affect Vermonters' health. Heat Impacts on Health in Vermont This document details the association of summer temperatures with heat-related illness and mortality in Vermont. Vermont Heat Vulnerability Index This is a two-page summary description of the Vermont Heat Vulnerability Index. Weatherization + Health This is a two-page summary of the health and climate change co-benefits of home weatherization in Vermont. Weatherization + Health Technical Report This report details how home weatherization addresses energy, health and environmental problems, and how weatherization improves home conditions that affect health. In the past 50 years, Vermont's climate has been getting warmer and wetter. In the future, Vermont will continue to get warmer and experience more frequent heavy precipitation events. Along with the cold, snow and ice, winter weather can affect your health. The cold can cause frostbite or hypothermia and can contribute to heart attacks when shoveling snow. Heat can cause serious illness. On very hot days, sometimes your body temperature can get dangerously high. This makes you at greater risk for serious heat illnesses. Vermont had 18 federally-declared disasters in the past 10 years, up over 50% from the preceding 10 years. Most of these disasters were a result of severe storms and flooding. The spread of tickborne diseases to humans, including Lyme disease and anaplasmosis, has been increasing in Vermont and many other northern states. Mosquitoes can be a major annoyance during warmer months in Vermont and can occasionally transmit serious diseases. As temperatures in Lake Champlain and other fresh water bodies continue to warm due to climate change, and with more heavy precipitation, conditions will become more favorable for blooms to occur. Heavy rains can wash contaminants into drinking, recreational and irrigation waters that can make people sick. Climate change is expected to increase allergenic pollen in the air we breathe, increase mold growth in homes and businesses, and could increase air pollution from sources like wildfire smoke. Climate change is having widespread impacts on buildings and infrastructure, agriculture and other weather-dependent businesses, the quality of the environment, recreational opportunities, and physical health.